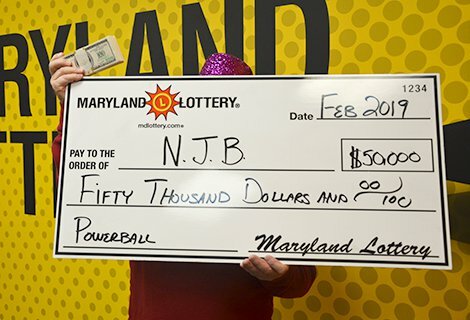 Semi-retired “N.J.B.” of Ellicott City says he’s really happy he won $50,004 playing Powerball and plans to save his prize. A self-proclaimed lucky man from Ellicott City has played the same set of Powerball numbers for years and won small prizes with the combination. For the Feb. 9 drawing, however, he hit for a much larger sum: $50,004. The winner, who is going by the name “N.J.B.,” plays a number combination associated with an identification number: 1, 2, 3, 5, 7 and 25 as the Power Ball. He was out the evening of Feb. 9 with his longtime girlfriend and decided to check the drawing shortly before midnight. The Howard County resident missed winning the Powerball jackpot by only one number! His combination was missing only the 5; the drawn numbers were 1, 2, 3, 7, 35 and 25 as the Power Ball. “I said, ‘I think I may have just won a lot of money,’ ” the happy player recalled telling his girlfriend while claiming his prize at Maryland Lottery headquarters in Baltimore. The couple scanned the ticket and a message flashed up that he had indeed won $50,000 on one line of his lucky ticket and an extra $4 on a second line for matching the Power Ball.